On a cold day there is nothing like Home-Made Soup to warm you up. Today I created a new recipe that quickly became my favorite. 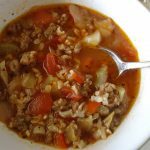 Using the ingredients for Stuffed Cabbage and enhancing it with Heart-Healthy Veggies, I came up with this Delicious Soup. Brown 1 lb. of Grass Fed Beef (or bison) plus 1/2 lb. of sweet Italian Sausage, crumbled. 1/2 Head of Cabbage, chopped small. Simmer for 45 to 50 minutes. Let cool 15 minutes. Enjoy.